This is one of my favourite breakfasts lately. Not only does it taste delicious, but it also incorporates some of the healthiest foods on the planet. Let me breakdown for you what’s included in this breakfast and why I’ve chosen the foods I have. Organic, free-range, pastured eggs: Eggs are a powerhouse of nutrition. They contain a significant amount of selenium – a very important antioxidant – as well as significant amounts of vitamin A, folate, vitamin B5, vitamin B12, vitamin B2, phosphorus, and decent amounts of vitamin D, vitamin E, vitamin K, vitamin B6, calcium and zinc. They also come loaded with protein, which is imperative in a healthy breakfast, and healthy fats, which are also super important for a plethora of different reasons such as reducing sugar cravings, improving neurotransmitter health, hormone balance and more. The reason I choose pastured eggs whenever possible is because they’re higher in omega 3 and also in vitamins A and E. Eggs also raise “good” HDL cholesterol and contain another nutrient that is super important for good health; choline. Most people don’t get enough choline, which is a problem because choline is vital for liver and brain health. Turmeric: I put turmeric in my eggs because lets face it – is there anything this spice can’t do? It’s anti-cancer, anti-inflammatory, protects against DNA damage and cardiovascular disease, helps alleviate Alzheimer’s and rheumatoid arthritis symptoms and is a very powerful antioxidant. The more turmeric we can consume the better (just be sure to add some black pepper to your turmeric in order to increase the bioavailability of curcumin – the active ingredient in the turmeric). Kelp flakes: Kelp contains high amounts of iodine, potassium, magnesium, calcium and iron as well as vitamins, antioxidants, phytonutrients, amino acids and omega-3 fats. It’s actually an iodine-powerhouse and that’s why I’ve added it to my eggs. Iodine is essential not only for the health of our thyroid to form the thyroid hormones thyroxine and triiodothyronine, but also for women’s health since kelp has been shown to reduce the risk of estrogen-linked breast, endometrial and ovarian cancers by decreasing levels of estradiol. I prefer to add iodine to my diet rather than supplement as supplementation can get tricky and can actually make thyroid issues worse in some people. Dietary sources however, are a safe bet and these kelp flakes are a great, easy way to get a healthy dose of iodine into your diet (and you don’t taste them at all!). Broccoli sprouts: Broccoli sprouts are one of the healthiest foods on the planet. For the photo of this breakfast I didn’t any any broccoli sprouts handy so I used broccoli sprout powder in the eggs instead. Both will give you the same amazing nutritional bang for your buck. These truly are a powerhouse of awesome functional nutrition and something I suggest all my clients consume on a regular basis thanks in large part to their sulforaphane content, which is a powerful anti-cancer nutrient. They also benefit healthy estrogen metabolism. 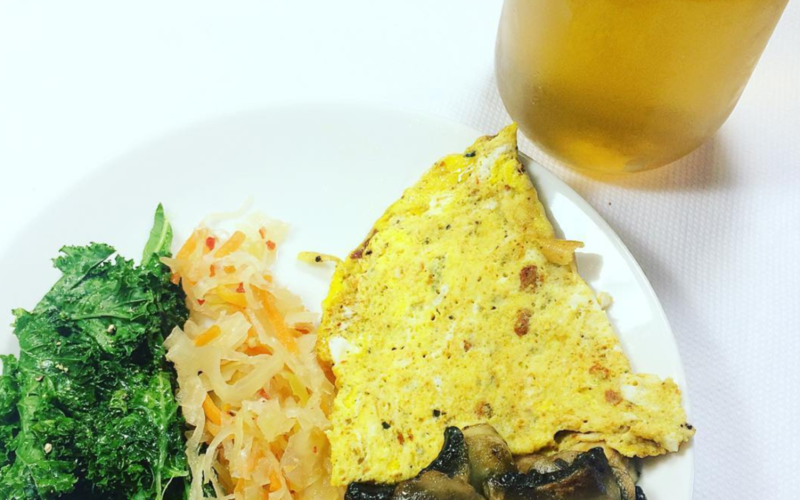 Kim chi: Fermented foods are a must for gut health. In traditions gone by ferments were consumed on a regular basis, mainly due to the fact that way back then we didn’t have access to electricity and fancy fridges so fermented foods were a way around this problem. However, whether our ancestors knew it or not, they were giving their gut a healthy dose of beneficial bacteria (probiotics) each time they consumed a fermented vegetable. Unfortunately this process of fermenting our food has been forgotten by many and this is one of the reasons why so many people are suffering from unhealthy guts in modern times and all the subsequent diseases that come along with that. You can’t have optimal health if you have an unhealthy gut. Kale: You must have been living under a rock if you haven’t heard yet that kale is one of the healthiest foods on earth, but why is this? Well, to start, kale contains one of the highest concentrations of the carotenoid, lutein. Lutein is particularly supportive of eye health and the prevention of glaucoma. It’s also exceptionally high in bone-supportive vitamin K, very high in vitamin A and vitamin C, and high in manganesse, copper, B6 and calcium. As well as all that, kale is part of the cruciferous vegetable family, which is a very powerful family of vegetables that’s important for liver health and detoxification as well as for cancer-prevention. Mushrooms: Mushrooms are amazing! They are anti-inflammatory, protective against cardiovascular disease, protective against breast cancer and are immune-boosting. My favourite type is actually the humble white button mushroom because this mushroom has been studied for its powerful anti-breast-cancer benefits. Bone broth: Bone broth is another gut-loving functional food. It contains calcium, magnesium, phosphorus, silicon, sulphur as well as collagen, which is an important nutrient for gut health as well as for the health of our skin, hair, nails and joints. Bone broth has been shown to be anti-inflammatory, immune-boosting and supports detoxification in the body. So there you have it, my favourite functional food breakfast of the moment. I strongly urge you to give it a try and know that before noon you’ve ticked off a heap of incredible functional foods from your “must eat” list. Great question Barb! I’m going to post a recipe shortly – so keep an eye on my emails / website! It’s super easy. You can also google “make bone broth” – I do suggest you make it in a crock pot as that’s so so simple.